Blog But What About Habitual Sin? But What About Habitual Sin? Do you feel trapped in a habitual sin that you just can’t seem to kick? There have been times in my life where I have felt that God would never set me free from habitual sin, that I would fall into time and time again. When this happens, it is sometimes easy for us to doubt the grace of God. We might believe that God’s grace can cover an infinite amount of sins, but perhaps we question in our hearts whether God’s grace can cover a particular sin an infinite amount of times. I know God’s grace covers an infinite amount of sins, but does God’s grace cover a particular sin an infinite amount of times? 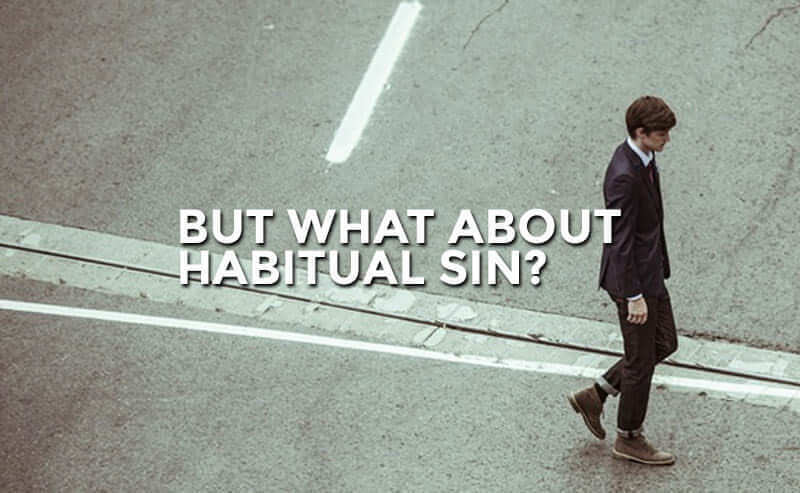 Sometimes habitual sin can make us feel hopeless when we ask God over and over to set us free. There have been points in my life in which habitual sin has caused me to be stop approaching God in prayer. Ironically, Christian maturity can be measured by how quickly one approaches the throne of grace with confidence after falling into sin. I could write a blog about how God’s grace covers all past, present, and future sins and write a nice little exposition on how God never stops forgiving his children. But we understand that in our head. We don’t want to just be forgiven, we want to be set free. And this is a God given holy desire. We don’t want to just be forgiven, we want to be set free. When I’ve felt trapped in a continual struggle with a particular sin, I’ve caught myself making the following statement in my heart: “If God would just set me free from this one area of sin, then I would be in a pretty good spot.” But the reality is that Christians are never meant to feel like they’re in a “pretty good spot,” because those who are in a “pretty good spot” don’t run to God. The Pharisees thought they were in a pretty good spot because they didn’t think they were poor in spirit. They thought they were good people and thus weren’t dependent on God for righteousness but rather trusted in their own works for their salvation. So my challenge to you is this: What is your motive for wanting to be set free? Is it so that you don’t have to be dependent on God? If being ‘poor in spirit’ drives us into dependence upon God, and we think that we’re only poor in spirit in one particular area, then why would God set us free from that habitual sin? It would be unloving for God to set us free from the one thing that is making us dependent on him. If he did set us free from that specific sin he would actually just be setting us free from himself. It would be unloving for God to set us free from the one thing that is making us dependent on him. If he did set us free he would actually just be setting us free from himself. So if we want to be set free from a habitual sin, we must realize that we are poor in spirit in all areas of our lives. When we realize that we need God in all areas of life, then we will start to see freedom in specific habitual sins. Because God does not simply want our obedience, he wants our obedience to flow out of our dependence. I’m convinced that God allows habitual sins to take root in our lives at times to make us dependent on him. There have been seasons of my life in which I was forced to be dependent on God because of my habitual sin. When I did see progress, however, I made a mistake in my heart. I thought to myself, “I’m in the clear now” and I stopped depending on God but instead started trusting in myself. Immediately, I traded that habitual sin for another one. Romans 8 says that all things work together for the good of those who love God (Christians). What I’ve learned is that our weakness, our poor in spirit-ness, our habitual sins, they’re meant to make us dependent on God. They are not meant to drive us away to clean ourselves up; they’re meant to drive us into the arms of a loving Father whose grace performs the “double-cure”: it saves from wrath and makes us pure.